Some U.S. counties are still closer to Saudi Arabia's law than America's. Half of Arkansas is "dry," and more than a quarter of the counties in Kentucky consider it a crime, if not a sin, to sell good Kentucky Bourbon or any other intoxicating beverage. The persistence of a few pockets of people who don't want alcohol sold legally in their community makes it unlikely that the 21st Amendment will be amended in our lifetimes. But the unintended consequence of this wording is the new Southern Glazer's Wine & Spirits LLC company, which will determine which wines, beers and spirits most Americans have the opportunity to buy in their local stores. I don't understand why the Federal Trade Commission allowed this merger. Before the merger, both companies engaged in anti-competitive behavior as much as possible, such as threatening merchants to stop carrying or promoting competitors' products, using the cudgel of withholding necessary big brands. This merger is bad for liquor retailers, many (not all) of which are small businesses. It's bad for restaurants, most of which are small businesses. And it's bad for consumers, as it will reduce choices and allow the distributor to set artificial monopoly prices. There is only one alternative to a local distribution monopoly: direct shipping of wine, beer and spirits from both producers AND out-of-state retailers. Shipping costs on bottles of liquid are high, so if it's cheaper in Tennessee to order whiskey from Texas than to buy it from the store down the street, that's a clear example of local monopoly pricing. For the many states and communities that don't yet allow full direct shipping, you are allowing a monopoly distribution industry to take advantage of your citizens. Protect them. Allow free and unfettered direct shipping of alcohol. That may not have been what Congress wanted in 1933. We're not in 1933 anymore, thank God. Laws change, morals change, and this is not Saudi Arabia. Let people drink what they choose. This post is truly baffling. "At the time, some communities -- probably the many Muslim parts of America, because we all know Jesus drank wine -- wanted to keep their states or counties dry." This does not make any logical sense in the context of Prohibition. Even a cursory look at the history of the Temperance movement in the United States reveals that it was mostly a Christian undertaking. Methodists, Northern Baptists, Southern Baptists, New School Presbyterians, Disciples of Christ, Congregationalists, Quakers, and Scandanavian Lutherans, along with social progressives from both the Democratic and Republican parties. 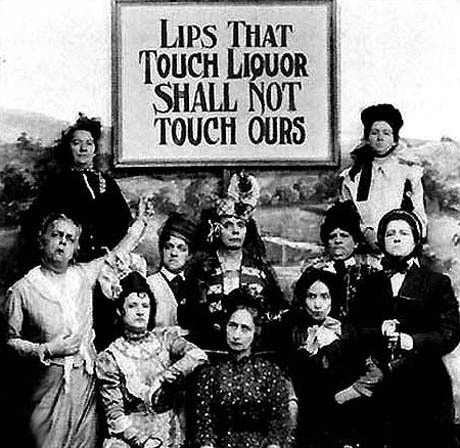 The Anti-Saloon League and the Women's Christian Temperance Movement were primary agents of the alcohol ban in America, not Muslims. This is common knowledge about the history of Prohibition. There was no connection then, and there continues to be no connection now, to the prohibition of alcohol in the United States and Islam. The spurious connection to Sharia law in a piece about market competition only serves to further the vices of ignorance and intolerance. Wow, you told me! Damn, I'm shamed! What Would Jesus Do in such a situation? Turn the other cheek? Perhaps drink some wine? Wow Mr. Gray so you want what you call a monopoly being the wine and spirit wholesaler to be taken over by Amazon, UPS and Fedex. Th wine and spirit company you are talking about is a family owned business. Even if they are huge. There are still hundreds of family owned small wine and spirit wholesalers in this country. I have to agree with Nauticalcore here... I think the article is a great topic and one that should be addressed. In your writings, you made excellent points about the monopolization of the industry and how the merger of SWS and Glazers could have a huge trickle down effect. I am baffled though, as to why you chose to bring in the Muslim piece. It took what was an informative article to a place that is incorrect and frankly really offensive (and I am not even Muslim). By taking this turn, you not only lost your reader but also took your argument backwards by making it look feeble and, quite honestly, ignorant. We all carry are own personal beliefs and opinions and all the better to you for having yours. However, voicing it in this manner was inappropriate and ineffective. Gelena: I'm trying to point out the hypocrisy of Christians opposing the sale of wine, when wine plays such a prominent role in the Bible. I co-opt the argument the far right has made about Sharia law in the US because Prohibition of alcohol IS Sharia law in the US. There's nothing Christian about restricting wine distribution, but it IS the law of the land in Saudi Arabia. If this piece gets wider readership, I hope that the comparison to Muslim law causes Christians who MIGHT be offended to consider what their religion actually says about alcohol. I also found it amusing. I am sorry that you did not. Blake, I got your joke and found it funny. For those of you who were offended, read between the lines as Blake was comparing anti alcohol Christian fundies with Islamic fundamentalists. Gray - Your comparison to Sharia law really took away from the point you were trying to make and it really discredits your post. If you wanted to establish the religious influence of prohibition you should have done that earlier in the article and used facts to substantiate your hypothesis that Muslim communities wanted to keep their states and counties dry. Then you give the example of Kansas being the last holdout in 1948. Do you realize that Muslims CURRENTLY make up .9% of the US population? In 1948 it's fair to say that the vast majority of Muslims in America were descendants of the slaves (read as black) and, regardless, had very limited civil rights and nearly zero political influence...especially in Kansas where there were probably, say a few thousand Muslims in the entire state. I get it, you're trying to say that the prohibition of alcohol transportation is akin to Sharia law. But introducing the idea that Muslims had anything to do with this influence is irresponsible and it perpetuates the evangelical Christian propaganda that relies on fear mongering and threats of our "American" God being slowly ripped away. When you prick the sanctimonious, I guess you should expect some sanctimonious pricks back. It's funny reading the comments of those people who you gave a first class wedgie. Right wing Christians hate it when they're reminded how close some of their beliefs are to Sharia law. Perhaps you should have said "ghost written by Ron Washam", but they probably wouldn't get that, either. I'm amazed how many commentors totally missed the tungue in cheek and instead were offended by your nonexistent micro-aggressions. Jeez..people have a lot of time on their hands .huh? MBG...well done! Spot on, sir. I was hoping someone else out there on the World Wide Web had considered this whole Southern Glazer merger as the definition of a monopoly. And, as a Kentuckian working both for the wineries of the Commonwealth and with the government, I concur that state laws are insane- not to mention the ever increasing sin taxes! Distribution and the whole concept of the three tier system is crazy. Well said.